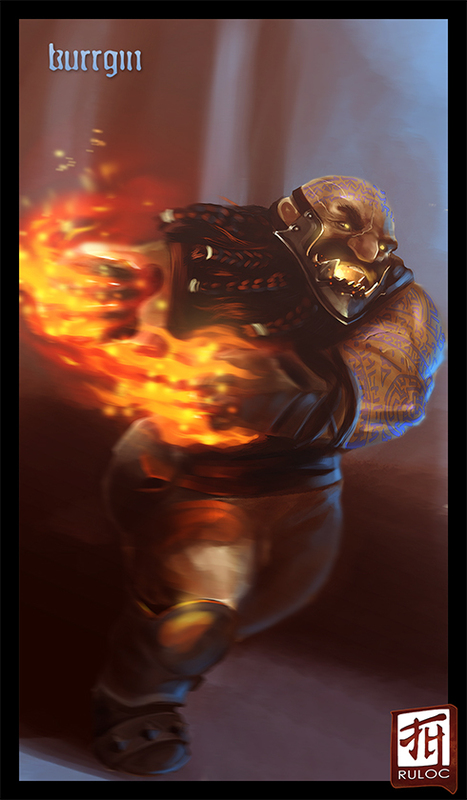 Kurrgin is a dwarf of the Anvilhand clan, a highly atypical organization of nomadic aberration hunting dwarves; they go to where the nasty things live, and make them regret (if only briefly) that they are nasty things. A gross oversimplification, but apt enough. They carry a strictly hereditary form of lycanthropy (werewolves) and have strong religious ties to Fenrir. Kurrgin is a monk of the clans long martial tradition (recently converted to a Tetori) with phenomenal strength who mangles enemies to death with his fists...well, technically with a mean looking pair of gauntlets/cestus. Physically, Kurrgin has a long, heavily braided black beard that is starting to show grey, gold eyes, a shaved head covered in scars, intricate knotwork and runes (these also cover most of the rest of him), and eerie, almost exaggerated predatory features. Like a 5.0, 230lb wolfish tombstone that looks like it's thinking very grimly about crushing and eating you. He has the elemental fist feat and is progressing down the dragon style feats in Ultimate Combat, and will soon be breathing out the occasional flaming "fus-RO-DAH!!". But in the meantime, his hands being shrouded in ki fire would look really cool...maybe with a hint of fire escaping his mouth. He wears functional dark robes, and sometimes an iron half-mask that resembles a foo wolf's jaws. Various charms and religious icons are wound into his handwraps, and a number of trophies (including some dragons teeth and claws) are worn about his wrists and waist. He wears boots that one would normally expect to see accompanying a suit of armour, heavy iron plated things with short, thick square spikes in a band across the toes. Other than that, he carries minimal equipment, almost all of which is stored in his haversack.